The Knifty Knitter long loom is very versatile. It is a great tool for crafters who are not skilled knitters or knitters looking for a different method for making projects. This is a guide about using a Knifty Knitter long loom. I purchased a set of oblong looms provocraft knifty knitter, and would like directions on putting together a blanket/afgan. I am tired of making scarfs. I make strips like a scarf. I then sew or crochet them together. Where can I get the actual instructions for the Knifty Knitter long loom? Walmart Super Center stores and maybe eBay. I found my book for long loom instructions at Hobby Lobby store. You should be able to get it at any craft store. I need help with the purple rectangular Knifty Knitter. The instructions of how to get started on this loom are impossible to understand. This loom doesn't have the rounded ends with a peg, just 18 opposing pegs. I can't find any videos on the web to help. Once I understand how to put on the yarn and knit the first row, I can take it from there. Thank you kindly! Yahoo groups has a few groups of knifty knitter groups. They are VERY helpful and have instructions, videos, books and free patterns as well as being able to ask others about problems and questions. Just go onto Yahoo, then to groups and do a search for knifty knitter, and loom knitting.My first project was a dog sweater for my poodle. It was VERY easy to do. I also have the puple rectangular Knifty Knitter - but mine came with an end peg. Perhaps you should contact the company about getting another peg? Question: How Do I Do Circular Knitting on a Long Loom? Do you have any instructions on circular knitting on a long Knifty Knitter loom? I bought some "Loom Clips" for less then $4.00 that allow me to change the number of pegs on my long loom to any size I need. For instance, if your pattern calls for 18 pegs, you just put the loom clips on your long loom so that you have an 18 peg oval, and then you follow the pattern the same way you would for a round loom. Here is a picture of the Loom Clips. How do you use the rectangular (purple) Knifty Knitter loom to do a single knit scarf? The first several rows on the oblong Knifty Knitter are too loose, even when I work with two strands of yarn at once. This makes it hard to join squares together firmly. Any suggestions? How do I use a single knit on a long loom? The video supplied shows how to go about doing the first row, but fails to show how to connect the chains and cast off. Can you please help? 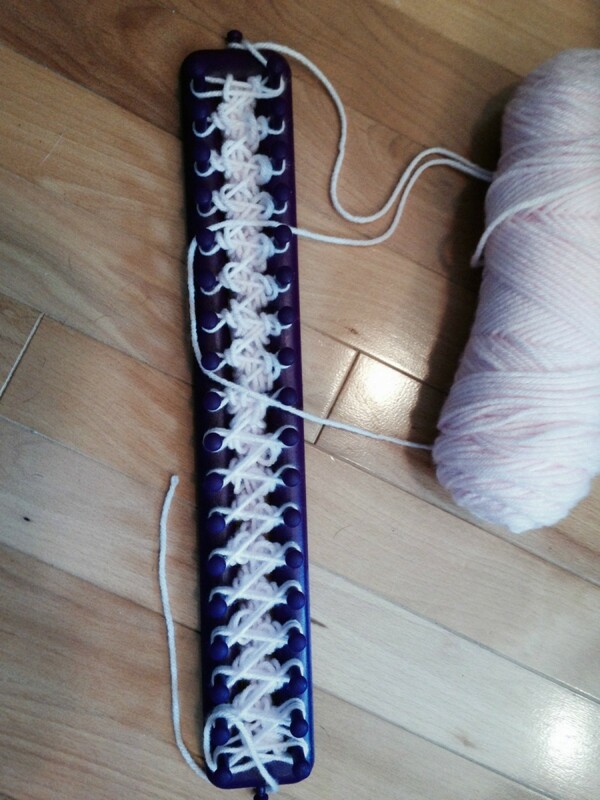 I am looking for patterns for a long loom. I just started a honeycomb stitch scarf on my long loom and realized I don't know how to bind off this particular one. A video or instructions would be helpful. Thank you. This is a guide about patterns for a Knifty Knitter long loom. Knitting looms are an easy way to knit even if you are not an experienced traditional knitter. A Knifty Knitter is an easy tool to make a knitted blanket. They come in many shapes for different projects. This is a guide about making a blanket with a Knifty Knitter. I am looking for video instructions on how to use the Knifty Knitter long loom series. Thank you. I lost the tool that came with my Knifty Knitter, and I have discovered almost anything works in it's place. I have used a knitting needle, dull scissors, a metal yarn darner sewing needle, and almost anything else I can dig into the stitches without cutting them or shredding them. You can find instructions on the internet by simply typing something along the lines of: Knifty Knitter, Loom Knitting, and Rake Knitting. Several years ago, I received a gift and when I went to open the box to use it (a few months later), there were no instructions. I just e-mailed the manufacturer, and they quickly sent me a set of instructions. Provo Craft makes Knifty Knitter. If you contact them, they should send you the needle, hook, and instruction booklet for free. I purchased the long purple loom, and somewhere between my mother and my son, the instructions are missing. Can anyone tell me where to get instructions for it? I got mine for Mother's Day and could never figure it out. Then, yesterday, I went on to youtube.com and found a girl named Joccy who puts videos on that show you how. She's a young girl and she explains it perfectly! I actually finished a scarf today. Just go to youtube, search Knifty Knitter and you see Joccy. She has about 3 videos. Perfect! I bought the Knifty Knitter long loom series and there was no instructions with it. I know I should be smart enough to do it without instructions but I guess I'm not.